The Life Fitness T5 is ON SALE! I recently reviewed the Life Fitness T5 treadmill at US Fitness in Cary ,NC . It was exactly what I would expect from Life Fitness. A quality machine that ran quietly even at higher speeds. Although Life Fitness is best known for the commercial grade elliptical trainers,they also build some very impressive treadmills. The T5 is their mid-range model. The most important feature on the T5 is the Life Fitness reputation for excellence. Life Fitness is known for having low maintenance equipment,and responsive customer service. Overall they build superior equipment, whether treadmills or ellipticals, but it comes at a price. Purchase the Life Fitness T5 Treadmill Today! The Life Fitness T5 typically starts at $3,999. The Life Fitness T5 treadmill comes with your choice of consoles. Go Console — The Go console are for individuals like myself who only require basic feedback and stats. The Go console comes with 12 installed programs, 2 user profiles and 2 customized program. custom workouts through your iPhone or Android device. USB port that can be used to download future updates to the machine. iPhone controls on the console. Open software so you can interact with 3rd party apps. The MSRP for the LifeFitness T4 with the Go console is $3,999, and the version with the Track+ console is $4,399. 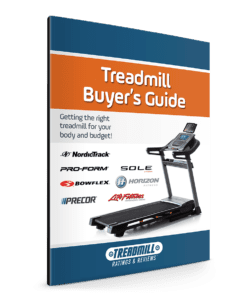 You typically can negotiate that price down or get free shipping and set-up when dealing with a fitness equipment specialty store. 3.0 Continuous Duty 3.0 HP Motor – This motor can handle runners and multiple users. However, it is a bit noisy at higher speeds. 22″ x 60″ Treadbelt – I really like the 22″ wide belt. You do not feel confined, and the extra 2″ allows you to run more naturally. The 60″ long belt is appreciated when you are running or if you are above average height. 341 lbs Assembled Weight – At 341 lbs, the Life Fitness T5 is as solid as any commercial treadmill. FlexDeck – This shock absorption deck does a good job of absorbing impact, but still provides for a firm push-off in your stride. Wireless Heart Rate Control – HRC is a preferred method of training for professional athletes. By training within certain heart rate zones, you can optimize your workout. Warranty – With the LifeFitness T5 treadmill you get 10-years on the motor, 7-years on parts, 3-years console and 1-year on labor. The 7-years on parts is above average. There are a number of reasons why the Life Fitness T5 is a superior machine, and worth considering. It has some excellent features and it is a very durable treadmill. Although there is one feature I did not like, and that is the extended control panel that sits in front of the console. The design gives you easy access to common controls like speed and incline. However, it sticks out over the belt and forces you move back. Consequently, you lose several inches of usage on the treadbelt. Also see the Life Fitness T3 Review.